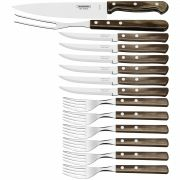 Carving Sets - View our range of Carving Sets here at Anthony Ryans cookware shop, offering excellent quality Carving Sets to suit your needs. 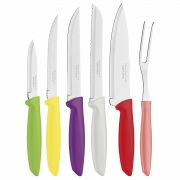 Carving sets include your carving knife and fork. 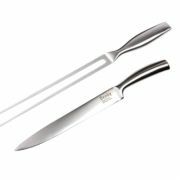 The carving knife will have a large blade anywhere from 8 to 15 inches long and are generally used for carving large roasts, poultry, and filleting large fish. The blade edge of a carving knife is smooth or bevelled. For easy of carving the blade should be large enough to carve across the cut of meat, poultry, or fish in one sweep. The carving fork then holds the meat steady while the food is being sliced, keeping the other hand safe while the knife blade while cutting. Carving forks typically have two long prongs that are easily inserted into large cuts of meat keeping it stable as it is sliced. So pick up a set and you’ll have all the tools you need in one tidy case.